The Somerset Pharmacy ten kilometre handicap was run Sunday on a tough hilly course utilising Somerset’s Back Cam Road. The event gave runners their second last chance to record a win for the season and so was keenly contested. The pair have been enjoying close competition in recent weeks although neither has quite managed to break though. 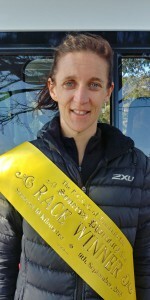 Ellen won last year’s Burnie to Ridgley race so was well proven on this type of course. She mixes her running training with cycling which she was forced to take up a couple of years ago due to a persistent hip injury. Roselyn Hendriks was the first away and led for all but the last kilometre when caught first by Ellen and then Arnold. She battled on very strongly to finish fifth with Troy Reader and Simon Gates running superbly from back marks in to third and fourth places respectively. Other eye-catching performances were recorded by Josh Febey and Nick Young while Thomas Wilson finished eighth and also recorded fastest time. Terry Watson and John Badcock rounded out “the ten”. The nominated time winners were Ashley and Mia Fehlberg, Brain Paine, Hannah Elphinstone and Lucy Campbell.